1. Green Eagle. 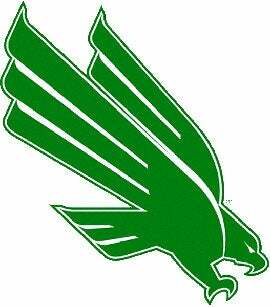 Although we all know UNT as the Mean Green, the school mascot is actually Scrappy the eagle. And Scrappy he is. In 1974 (back during Vietnam, when college students used to protest war in between bong hits), the school scrapped "Scrappy" because the flower children thought his name was too warlike. They renamed him "Eppy" the Eagle. That name stuck until December 2, 1995, at the UNT vs. Alabama Crimson Tide game, when the college announced that Eppy was Scrappy once again, no doubt pleasing many-a-confused fan who'd spent two decades wondering what the hell "Eppy" even meant. As for the "Mean Green" moniker, it's usually associated with 1969 UNT graduate "Mean" Joe Greene, but there is another story that links it to a couple of jokers starting a chant at a game back in the '60s. Understandably, most Mean Green fans prefer to stand by the Joe Greene story. 2. Cannon! North Texas loves its victory cannon. It's as much a part of the UNT family as Eppy, er, Scrappy the Eagle. They love that cannon so much, he even has a name! It's Boomer. Boomer the cannon. Boomer has been blowing his explosive wad to signal touchdowns since 1970. The original Boomer was retired in 1996 when the U.S. Field Artillery Association for Texas deemed him unsafe to fire, but the school promptly had him replaced. Which means that today's Boomer, a scale replica of a Civil War model, is actually Boomer II. The Son of Boomer. Boomer Strikes Back. The Wrath of Boomer. And so forth.